This is a rather shocking story which reads, forgive me, a little bit like watching the film Thelma and Louise. You can sense the imminent danger that lies ahead from the very first page. Two young and naive girls from Holland, vacationing in their parents’ country of Morocco, come across a young man named Saleh. He leads them through alleyways to a hovel, where the ceiling is little higher than the door, and introduces them to a young man named Murat, with terribly decayed teeth, and his mother. They are living the poorest existence, and yet set out a tray of dates and tasteless pastries for their visitors, giving the very best of what they have. She couldn’t stand the poverty, the heat, and the dust. It exhausted her. There was compassion in her, but beneath the surface also the conviction that poor people had only themselves to blame for living like this. A kind of payback for something. That thought bore her up a little, made it easier to tolerate what she was seeing. But Thouraya and her friend Ilham begrudgingly agree to do as Murat’s mother begs them on her knees; they agree to take Murat in their rented Audi, stuffing him in the trunk where the spare tyre goes, piling suitcases on top of him to keep him hidden. Lots of Moroccans cross like this, according to Saleh. It happens all the time. If they don’t help, they are heartless and selfish. If they do help, they take dreadful chances of being apprehended. It is a terrible dilemma. If her (Ilham’s) own parents hadn’t risked the crossing, she might be in the same situation as this woman on her knees, this desperate family that smelled of poverty. A bitter feeling of gall rose up in her – she, the ingrate, who had been given every chance in life, was now denying that to someone else. Of course, they decide to hide Murat in the car as they cross on a ferry, and of course (as you can tell by the title), he dies of suffocation in the trunk. When Saleh sees that Murat is dead, he takes the money given to them and flees. The girls must figure out what to do with the body, and having no money, on their own. They are thousands of kilometers from home, and they have the gas left for only a couple of hundred kilometers. It makes for an interesting story, of people taking advantage of one another, but more importantly addressing an issue so prevalent today: immigration. Murat’s body in the trunk starts to produce a terrible smell, as someone from the shadow jury pointed out, so like the smell that immigrants give for those who don’t want them in their country. As the Man Booker International Prize so often does, The Death of Murat Idrissi makes a profound political, as well as a literary, statement. Religion was the sole font of morality. It bestowed human dignity, without which our lives would resemble those of dogs. Only teachers were allowed to ask questions. If we did not understand a word or explanation, the fault was ours. The future is too immense for her to imagine. It will happen, that’s all. Like sexual desire, memory never stops. It pairs the dead with the living, real with imaginary beings, dreams with history. But. Halfway through this memoir, a piece which was the co-winner of the 2019 French-American Foundation Translation Prize in Nonfiction, yet was included in the Man Booker International Prize which awards the “best, eligible full-length novel”, I became so weary I had to lay it down. Endless streams of observations like this, pertinent as some may be, became exhausting to read. Clearly the official judges, and the members of the Shadow Jury, do not agree with me. They have given reason, plausible I’m sure, as to why The Years should be included as a piece of fiction. Perhaps that is all that needs to be said: our memories are not fully real. Do not be surprised to see this on the Shadow Jury’s short list, nor, I dare say, on the official short list. It just won’t be on mine. Addendum: After reading this interview with The Guardian, my dislike for The Years became clearer to me. Because I am a stranger in this world, more often than not having an opinion directly opposite of the mainstream, the interview with Annie Ernaux made me sad. I see her as an angry, hurt woman, and her book seems to further the anger of women (in the current #MeToo trend). She does not speak for me. I love men; I love being protected and honored by men such as my father, my husband and my son. Some of my greatest friends are men, and I find the disparaging of men despicable. I feel sorry for her life’s frustrations, but they are not anything I feel personally. Nor do I feel they should be upheld in our society. Do the feminists really want a world run by women? I shudder at the thought. I had a hard time following this novel as I read. It seems simple enough: a story about Moon Hollow, a slum in Korea where parents and their children have to fight for their existence. But there are many points of view, many different names, and no heading at the beginning of each chapter to indicate which character may be narrating the story. Is is it Park Minwoo, who was able to lift himself out of poverty, go to college, become an architect, and all the while fail to consider the people he’s left behind in the slum? Is it Cha Soona, the beautiful girl who loves him? Or, is it Jung Wohee, the beginning playwright and director who has inserted herself, unbeknownst to Minwoo, into their lives? It all becomes clear in the end, while on the way to the conclusion there are terrible stories of life in the slum. Park Minwoo’s father fries fishcakes, Cha Soona’s family make noodles, and one group of children establish a shoe shine business. A group of ten raggedy-looking boys all work as shoeshine boys for Jaemyung, including his younger brother, Jaegeun. They are not about to lose their business to a kid named Tomak, who suddenly comes in from another neighborhood and tells them to find work elsewhere, especially as it is Jaemyung who keeps the family together after the death of his father. The fights that ensue, as he earns the right to keep his shoeshine stands, are terrifying and brutal. They are what is necessary to survive. It is disturbing to me that Park Minwoo is able to extricate himself so completely from this environment. On one hand, he is to be commended for gaining the knowledge and skill necessary to be a skilled architect, one who has worked himself up from such extreme poverty. On the other, how is it that he is able to distance himself so completely from his family and friends in their ramshackle houses? In the past, when slum neighborhoods were rebuilt, construction company employees would go door to door to offer some form of appeasement and get their signatures, but nowadays the process went no further than a reconstruction committee’s approval…Perfectly good buildings were ruthlessly demolished, the excavators letting out their terrible roars, while helpless shouts and cries rang out from among the protesters. The families would hold out for three or four days, but as the street filled with wreckage and rubble, they would start to leave, one or two at a time, and the community would fall apart, as splintered and fragmented as their demolished homes. Hwang Sok-yung’s novel is surely not appicable to Korea alone. With it, he causes us to look at the poverty around us, much of it overshadowed by mansions behind thick walls. How much responsibility do we bear to alleviate some of the suffering, not only for the good of the people, but for the good of ourselves? And so I stood, in the middle of the sidewalk of what was once Moon Hollow, like a man who’d lost his way. It is a bitter, sharp awareness that he has come to, facing the consequences of the choices he has made. Gretchen of Gladsome Lights has written a beautiful post entitled Four Sad Poems from the Japanese, taken from a collection of One Hundred Poems From the Japanese, gathered and edited by Kenneth Rexroth in 1964. Here is another post of hers highlighting two poems. One is entitled At The Boundaries of Life and Death by Jun Takami, and the other poem is by Kusatao Makamura. Michele of su[shu] has written a review of Hideo Yokoyama’s book, Six Four, a novel I have started at least three times and always abandoned as I was intrigued by the mystery, but found the police bureaucracy so tedious! She has also read and reviewed The Emissary by Yoko Towada, published outside of the States as The Lost Children of Tokyo. Sylvie, of Sylvie’s English and French blog, read and reviewed Farewell My Orange by Iwaki Kei. It sounds like an unusual and touching book, reflecting Sylvie’s caring heart when she wrote this sentence: “Written with great warmth, Farewell, My Orange offers optimism in the face of adversity.” It won the Kenzaburo Oe prize. There is only one week left in March, and so I will write a wrap up post for the Japanese Literature Challenge 12 on Sunday, March 31. I have enjoyed writing a weekly post highlighting what I know has been read and reviewed, but I am certain I have not caught all the posts written or books read for the challenge. Do let me know if I can link to something I have missed. With the Japanese Literature Challenge coming up to the time that the Man Booker International Prize long list is announced, I find my interests rather divided. I am thinking that next year, the Japanese Literature Challenge 13 will be for only one month: January. What do you think of that? While the duration is shorter, the intensity is more concentrated, and that appeals to me, but I am always interested in suggestions and improvement. Until next Sunday, then, happy reading! The first thing I loved about this book was how it mirrored my experience in Japan this October. I could immediately relate to seeing Japan for the first time from a Westerner’s point of view. The cleanliness, the bare beauty, the efficiency, everything described was similar to what I noticed as well. Gilbert Silvester has dreamed that his wife Mathilde has been cheating on him. And so he flies to Tokyo on a transcontinental flight, leaving quite abruptly. Soon he meets Yosa Tamagotchi, who is poised to throw himself in front of a train because he is terrified he won’t pass his exams. Because his beard is trendy and neat, and Gilbert is a beard researcher, Gilbert decides to speak to him. Because Yosa is a Japanese young man, and therefore extremely polite, he interrupts his plan to talk with Gilbert. Gilbert suggests there must be a better place for Yosa’s intentions. He decides to follow the poet Basho’s footsteps to Matsushima, “the most beautiful place in Japan, the bay of pine islands.” They would travel to the pine islands, taking the same route Basho took; it would be a pilgrimage, a journey of spiritual cleansing. Somewhere along the way, Yosa disappears. We do not find out if he has changed his mind, or if he has gone elsewhere to fulfill his original plan. Several times, Gilbert thinks he sees him, but perhaps it was only a reflection in the tea bowl or in a dream. Gilbert makes it to the pine islands himself. He writes haiku as Basho did, and explores his journey. This haiku examined the relationship between durability and ephemerality, the unremitting transitoriness of things, of travelling. It is such a quiet kind of book that I didn’t realize its impact until I closed it. Only then could I see that the implications are universal. We are all ephemeral. p.s. The night has passed since I finished this book and wrote this extremely brief post. I am still thinking about all the nuances within its pages, about the haikus and how difficult they must have been to translate accurately. 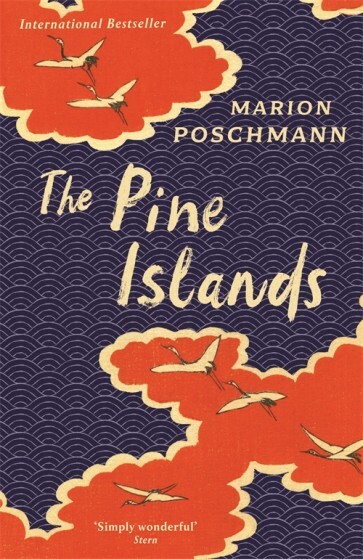 Typical of so many Japanese novels, The Pine Islands is more of a “slice of life”: dropping us in, and pulling us out, of the story before anything is truly settled. We take the pilgrimage with Gilbert, mimicking Basho’s travels. And the more I think about it, the more the novel has crept into my mind like a mist which will not readily dissipate.